Scorpion joins the next line up of characters in Injustice: Gods Among us, The previous entry to the DLC characters was Batgirl and despite the early judgement went on to be given the red carpet welcome. The latest character to join the ranks of the DLC bunch is a cross over character from another fighting game but not the same comic universe, We see legendary Mortal Kombat Character, Scorpion making a comeback and his appearance is slightly altered but still makes him a force to be reckoned with. 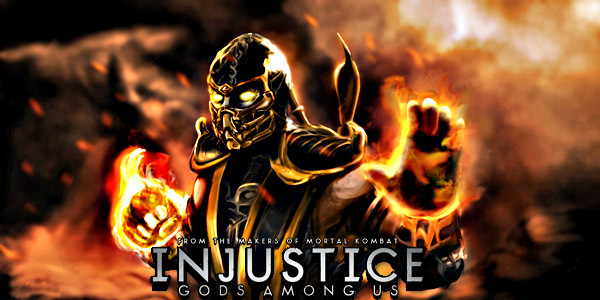 Scorpion, The man with a flame engulfed skull is a fish out of water in Injustice: Gods Among Us, can he take the heat? Scorpion is the latest entry into the world of Injustice: Gods Among Us, Falling in line right after Batgirl and will be succeeded by (you don’t know have to kneel before him) Zod. While I don’t think Scorpion should have been included in the game and should have been substituted with someone else that would have made the game truly stand out such as Martian Man Hunter or Beast Boy . As you can see, Scorpion is indeed a formidable fighter and effectively helps confirm the new M.O that NetherRealm Studios wishes to establish for themselves, They are now very keen on making character cross overs, They did this with Mortal Kombat when they made Freddy Krueger the last DLC character and are doing it now by bringing in the legendary Mortal Kombat fighter, Scorpion back. I hope that next time, NetherRealm Studios chooses their new DLC characters more carefully so that they are as interesting and as unpredictable as they were in Mortal Kombat but didn’t really live up to their potential in Injustice: gods Among us. The Next in line for the DLC would be Superman’s arch-nemesis, General Zod, now THAT will be a fight worth seeing.